Salmon populations face several serious threats, including pollution, habitat destruction, overfishing, and climate change. In this publication, the reason for the downward spiral of salmon populations is discussed. 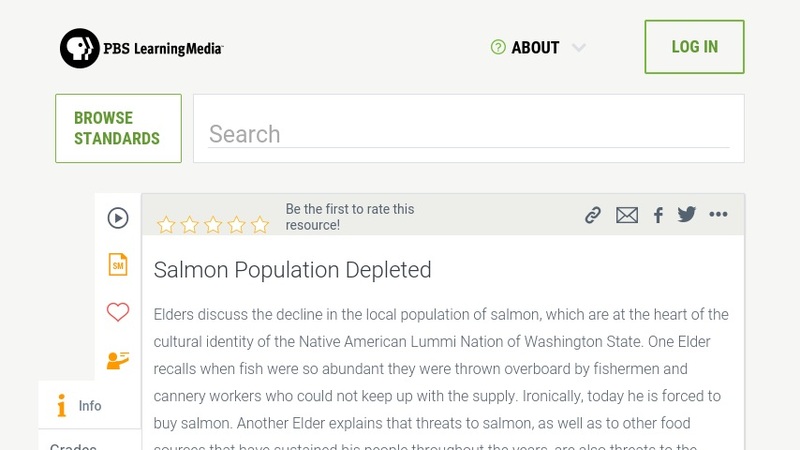 This video segment features Elders discussing the decline in the local population of salmon, which are at the heart of the cultural identity of the Native American Lummi Nation of Washington State. Fish were very abundant a few decades ago, but now even the fishermen have to buy fish. The background essay explains the many threats that the salmon population faces. There is also a brief description of the salmon lifecycle. The four discussion questions asks the reasons why the salmon population is depleting, and what people can do to help. There is a helpful section that shows your states standards for grades K-12, and links are provided for related resources on the teachers domain website.